The below email was sent to those who know Leah Krier in an effort to rescue her from continued self-destruction. Although it may not be recognized now as such due to its candor, it is well-intentioned and somewhat revealing. 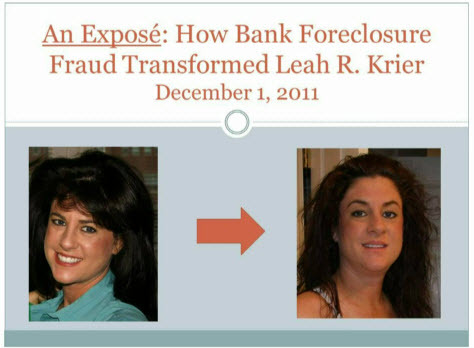 As we wrap up 2011, it's important to recognize the monster Leah R. Krier has sadly become, which is the byproduct of her manipulation by esurient bankers, unethical attorneys and corrupt public officials. To a certain extent, Leah is a poster-child for the after-effects of corporate greed that has also fueled the emergence of the Occupy Movement, which has been quietly growing in strength, despite reduced media coverage. Click here to access the unimaginable and seemingly unending instances of the insidious misdeeds Leah has engaged in as a result of her being victimized in the worst bank foreclosure fraud in US history, ALL of which was sponsored by Morgan Stanley. Since I began my active campaign to expose the FRESCA crimes of Morgan Stanley in the late Spring of 2007 (coincidently when Leah and I got engaged) its stock price has declined by 79%. That's $46 billion in stock value that has been wiped out. And I will step up my efforts to wipe out what remains if Morgan Stanley doesn't recompense me for its audacious fraud and vast ensuing transgressions of MorganStanleyGate,and amend its ruthless ways -- for I am certainly NOT its sole victim. And I continue to ask that you urge Leah to also amend her ways before its too late. She is on the wrong side of the law, and she will NOT be able to withstand the onslaught that now awaits her -- and I honestly have no desire that she be harmed any more than she already has. How does the saying go? You can lead a horse to water . . . Notwithstanding your failure to date in averting Leah's ongoing self-destruction, I wish you Happy Holidays and better luck in getting through to this misguided woman in the New Year.